American Manufacturer of floor standing and wall mounted commercial antibacterial wipes dispensers, Glaro Incorporated, releases an expanded line of FDA approved wipes noting three distinct advantages. Customer feedback has been very positive. Glaro Inc. offers something that no other manufacturer does. In addition to the wipes, we manufacture floor standing and wall mounted wipes dispensers as well as coordinated waste receptacles. This month, Glaro Inc. has introduced a new line of antibacterial wipes that are designed to eliminate germs and prevent cross-contamination. Glaro Inc.’s anti-bacterial wipes have always effectively killed germs; however, a modified formula now makes them safe enough to use on hands as well as surfaces. 1. Glaro wipes kill 99.9% of most germs in 15 seconds. Glaro wipes kill germs very quickly. The durable wipes are also very convenient and effective for removing dust and grime. 2. Glaro wipes are diverse, making them ideal for general use. Glaro 8” by 6” wipes are versatile enough to be used in almost any public or private facility. Facility managers at gyms, supermarkets, daycare centers, offices, and nursing homes will keep customers happy with the convenient use of our sanitizing antibacterial wipes. 3. Glaro wipes are safe for surfaces, and hands. Glaro wipes have active ingredients that sanitize but do not harm the body upon contact. Executives explain that they have been specifically formulated for use on both objects/surfaces and hands. Glaro Inc. wipes are available in convenient double packs (2 rolls of 900 per box) or in four packs (4 rolls of 900 per box) through an extensive network of Dealers. To learn more about Glaro wipes dispensers, antibacterial wipes, and receptacles on Glaro’s website, visit: http://www.glaro.com or call (888) 234-1050. Most wipes products are available for immediate shipment. Glaro Inc., a New York based company, manufacturers product lines including aluminum and steel waste and recycling receptacles, bellman carts, platform trucks, smoker’s posts, crowd control equipment, and coat hanging equipment. 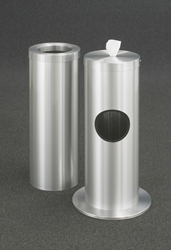 It also manufactures anti-bacterial wipe dispensers (and coordinating receptacles), FDA approved wipes, safety barriers, sign frames, directories, indoor umbrella holders, wet umbrella bag stands and bags, and key drop boxes.